We saw in December that governments seem to be expected largely to take responsibility for dealing with climate change, rather than to encourage people to be responsible themselves. This struck me then as a problem, and data from January’s Mori poll adds weight to this thought, suggesting that there is a real risk in politicians being the main group that’s heard to talk about climate change. But the results also give us some of the most striking results I’ve seen to suggest that the British public are in fact pretty concerned about climate change. 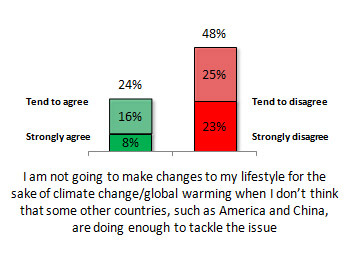 At the end of their questionnaire, Mori asked the respondents their level of agreement with a series of statements, covering perceptions of climate change, personal responsibility, and the role of government. What the responses suggest is that people are worried about climate change, but are highly suspicious of politicians’ motives when they hear them talking about it. The statements around the importance and impact of climate change indicate that levels of strong scepticism among the public remain relatively low. More than twice as many strongly disagree that climate change is “scaremongering”, and very few accept the argument that climate change is not necessarily bad for the planet. Nevertheless, climate change is widely seen to be an extremely bad thing. When asked about the impact of climate change in the UK and globally, comfortable majorities see it as really very unpleasant. Climate change is believed to be likely both to endanger the whole of like on earth, and not to give the UK better weather and more sunshine. The sometimes-used sceptic argument, that it will actually make the world more liveable (or have no impact), appears to have been roundly rejected. But when we look at the political results, there’s something far less reassuring for those trying to build public support around tackling climate change. As we’ve seen, governments are felt to have the most responsibility for the issue. But the Mori poll is clear in showing that politicians are also hugely distrusted when they talk about climate change. So great is this distrust of politicians, that even while there is widespread acceptance that climate change is happening, the government is still believed to be using it as a ruse to raise taxes and distract people from other issues. It’s clear that allowing politicians to be the only voice that is heard promoting action on climate change would be (maybe already is) very counter-productive. This entry was posted on Monday, March 29th, 2010 at 23:25	and is filed under Climate Sock, Climategate, Politics. You can follow any responses to this entry through the RSS 2.0 feed. Both comments and pings are currently closed.